WASHINGTON — European launch provider Arianespace completed the 100th launch of a heavy-lift Ariane 5 rocket Sept. 25, carrying two satellites co-owned between Intelsat and partner satellite operators. 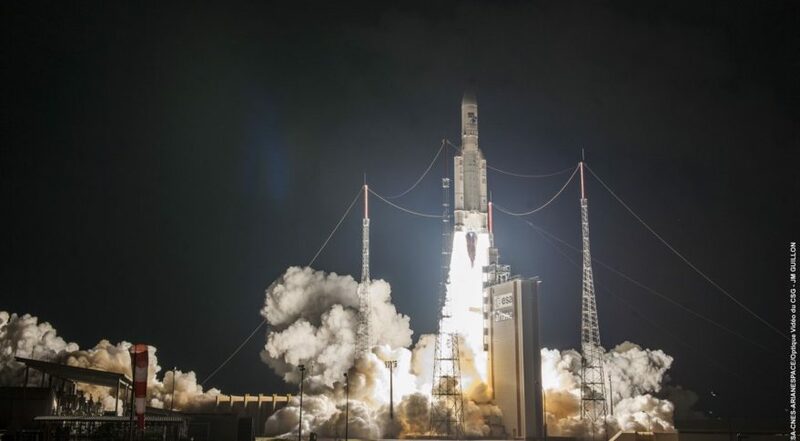 The rocket lifted off from the European spaceport in Kourou, French Guiana at 6:38 p.m. Eastern at the end of its 45-minute launch window, carrying the Horizons-3e and Intelsat-38/Azerspace-2 satellites. The 6,400-kilogram Horizons-3e satellite from manufacturer Boeing separated from the rocket’s upper stage 28 minutes later, followed by the 3,500-kilogram Intelsat-38/Azerspace-2 from Space Systems Loral 14 minutes later. Luxembourg- and Washington-based Intelsat confirmed signal acquisition from both spacecraft shortly after separation. Intelsat-38/Azerspace-2, a condosat satellite that houses distinct telecom payloads for Intelsat and Azerbaijani satellite operator Azercosmos, was originally due to launch in late May, but was delayed when the Indian space agency ISRO withdrew its co-passenger, the GSAT-11 satellite, from the mission for additional inspections. Ariane 5 rockets typically launch with two satellites at a time, requiring satellite operators to sync their schedules together for a mission. Rather than coordinate with another operator, Intelsat was able to pair Intelsat-38/Azerspace-2 with another of its own satellites that was already scheduled for a late 2018 launch. “Fortunately both satellites were ready at the same time,” Intelsat CEO Stephen Spengler, said in a Sept. 25 interview ahead of the launch. The Ariane 5 launch marked Arianespace’s sixth mission of the year, and is one of a shrinking number of Ariane 5 launches to complete before the next-generation Ariane 6 takes over. Ariane 6 begins launching in 2020 and will operate at the same time as Ariane 5 for a three-year transition period that ends in 2023. The Ariane 5 first launched in 1996. After a spat of failures in its early years, the Ariane 5 completed 82 consecutive successful missions from 2002 until this January when a rocket with the wrong coordinates placed two satellites in off-target orbits. Arianespace and the rocket’s manufacturer ArianeGroup implemented corrective measures to prevent a repeat of the errant launch. More than half of the 207 satellites launched aboard Ariane 5 rockets have been for non-European customers, according to Arianespace. Telecom satellite operators around the world have relied on the Ariane 5 as a mainstay for placing their spacecraft in orbit, along with rockets from U.S. and Russian launch providers. The launch was also the 300th of an Arianespace-operated rocket. The company’s next mission is the Ariane 5 launch of BepiColombo, a Mercury-bound spacecraft for the European and Japanese space agencies on Oct. 19. For Intelsat, the launch marks the completion of its “Epic” series of six high-throughput satellites designed for broadband and connectivity services globally. Horizons-3e brings high-throughput coverage in C- and Ku-band over the Asia Pacific. It is a joint venture satellite Intelsat co-financed and operates with Sky Perfect JSAT of Japan. Spengler described Horizons-3e as “the most advanced satellite that we have ever had constructed.” The satellite features a “multiport amplifier” that enables Intelsat to adjust the power given to different beams in the satellite’s coverage, making it more responsive to changes in demand. Intelsat-38/Azerspace-2 is a more “conventional” satellite, he said. Intelsat’s half of the Ku-band satellite supersedes Intelsat 12, supporting television broadcasts in Central and Eastern Europe and the Asia-Pacific, as well as broadband connectivity for corporate networks and government services in Africa. Spengler said the satellite has a steerable Ku-band beam that can be repositioned over a desired area in Africa within about 20 minutes. Government customers are expected to use the steerable beam, he said. Azercosmos’ half of the satellite is the operator’s second telecom satellite. It’s first, Azerspace-1, launched in 2013 on an Ariane 5 and is partly used by Measat of Malaysia under the name Africasat-1a. Intelsat is in its first year of a lower annual capital expenditure plan as the company shifts from heavy spending on satellites to focusing on generating revenue from those new assets. Spengler said the next satellites Intelsat needs to replace are for television broadcast over North America, and are typically smaller and lower cost. Future high-throughput satellites, though further out, should be more reliant on software, enabling services “at a lower cost per bit and a lower aggregate capex,” he said. Spengler said Intelsat is in the planning stages for what will follow the Epic satellites.